Product prices and availability are accurate as of 2019-03-30 02:20:16 EDT and are subject to change. Any price and availability information displayed on http://www.amazon.com/ at the time of purchase will apply to the purchase of this product. 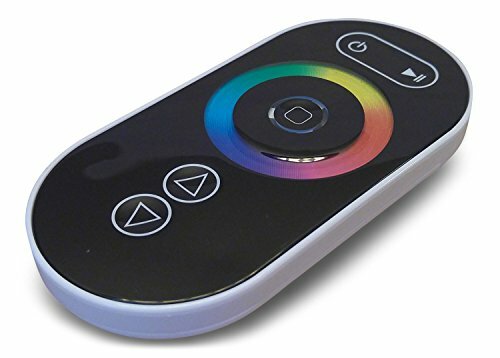 LED Lightsource's wireless RF remote uses a five button capacitive touch remote to dim, control lighting colors/patterns, and power on/off your LED lighting products by sending a signal to the included RF receiver. The controller has 15 preset patterns including: static color, 3-7 color blink, cross fade, gradual change, and more. You can also control the speed and brightness for each pattern. There is no line of sight required so you can use the remote anywhere within 60 feet of the controller. The remote also features a touch color ring and LED indicator light which allows you to easily select the desired color. This unit is compatible with 12-24V RGB LED light fixtures, including 5050 and 3528 LED strips, wall washers, light ribbons, and downlights. The controller comes programmed to be operated by the remote from any set, but can also be changed by the user to only operate with the matched remote. 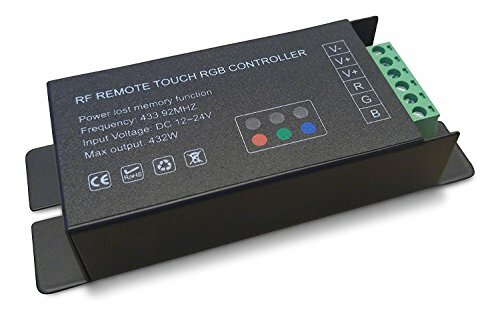 This allows the user flexibility in installing multiple controllers in the same area without interference. The remote requires three AAA batteries (not included). • Remote Size: 4.50" x 2.25" x .75"
• Controller Size: 5.00" x 2.00" x 1.00"